I redesigned Prevee to make it look less like Eevee. Flavor Text: Prevee has a shy personality. Unlike its evolution, its DNA is more stable. It is sensitive to powerful sources of energy. Its quiet, timid disposition may have delayed its discovery. I like this design much better. I originally was drawing this in an oekaki, but when I wanted to take a break, it wouldn't let me safety save it! So I took a screenshot of the lineart I completed, pasted it into Paint.net, and finished it there. 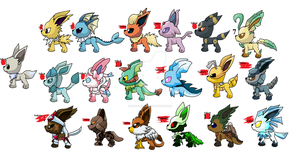 PS:I made this to enter into the Eevee FC Preevo Contest. EDIT: I took out all of the white spots from its eyes, and rounded off the tips of its feet. I think it looks much better now. Thanks for suggesting the changes Ket Shi! That's very cute, great design, I really like the way you colored it too. Preevee's design is very cute and fluffy, good job on that front. However, it's rather jarring how some of its limbs are rounded, and others are pointy. It would be best to have them one way or the other. Also, the black insides of the eyes have a lot of white speckles in them, especially around the rims, that don't look good. I know why there are speckles there, technical difficulties. Thanks for suggesting the limbs, I'll go see if I can fix that. 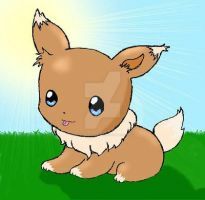 if it existed how does it evolve into eevee ? With a Mutation Stone, which is an item I made up that screws up the DNA of certain Pokemon. Raticate, Furret, Linoone, and Bibarel also evolve with this stone. I want one sooooo bad ! I've seen lots of fanmade evolutions for Eevee out there, but never a pre-evolution. And it's really cute, furthermore. I was kinda thinking Pichu when doing the redesign. I'm glad you like it! Yes, it is the only baby that gets Sketch as an Egg Move. Which opens up many possibilities.